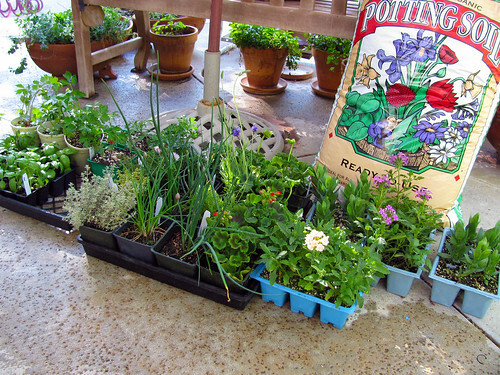 It is going to be hot today, so I am up early to get these herbs in their pots before the heat is on full force. Like last year I am going to put the basil over the upside-down cherry tomatoes. Instead of also having a pot of basil on the herb bench, I will do all the basil in hanging baskets. It just did better in that location. So in that bench pot I am adding lovage and rue. They just looked pretty together. Not sure what I will do with either of them though. I need to read about their uses. In a tall pot I am going to put in some lavender and thyme. I think that should look pretty too. This entry was posted on Sunday, April 19th, 2009 at 3:00 am and is filed under Garden. Tagged: Garden, Herbs. You can feed this entry. You can leave a response, or trackback from your own site. I love the smell of fresh herbs in the air!